It’s Hashtag Game-Mania! Let’s Get Ready to Raaaamble! Oh yes, it’s that time again! It’s time to unleash our puzzly and punny imaginations and engage in a bit of sparkling wordplay! You may be familiar with the board game Schmovie, hashtag games on Twitter, or @midnight’s Hashtag Wars segment on Comedy Central. 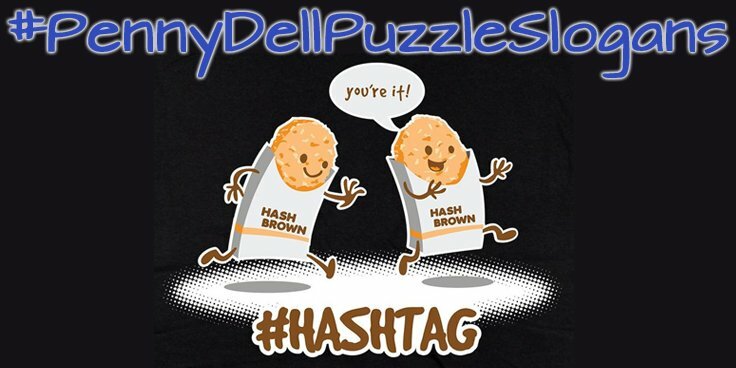 For years now, we’ve been collaborating on puzzle-themed hashtag games with our pals at Penny Dell Puzzles, and this month’s hook was #PennyDellPuzzleSlogans, mashing up Penny Dell puzzles with advertising slogans, jingles, catchphrases, and more! Examples include: Here and There’s the Beef, The Quicker Picker Upper, and A Diamond Rings is Forever. So, without further ado, check out what the puzzlers at PuzzleNation and Penny Dell Puzzles came up with! There were also a few submissions that deserve its their section, as several of our intrepid puzzlers went above and beyond. Have you come up with any Penny Dell Puzzle Slogan entries of your own? Let us know! We’d love to see them! Thanks for visiting PuzzleNation Blog today! Be sure to sign up for our newsletter to stay up-to-date on everything PuzzleNation! You can also share your pictures with us on Instagram, friend us on Facebook, check us out on Twitter, Pinterest, and Tumblr, and explore the always-expanding library of PuzzleNation apps and games on our website! Brain Teaser Week: Answers Edition!